It looks like not only me, but plenty of pork was eaten the past few days. But 'why' I asked myself. I found the following facts with the help of Epicurious.com. 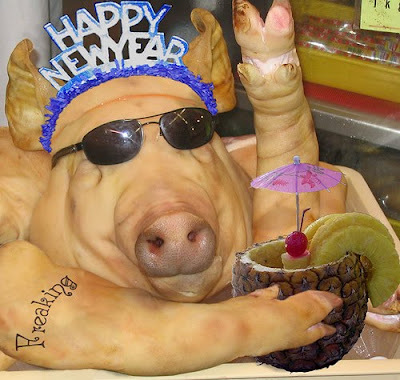 The custom of eating pork on New Year's is based on the idea that pigs symbolize progress. The animal pushes forward, rooting itself in the ground before moving. Roast suckling pig is served for New Year's in Cuba, Spain, Portugal, Hungary, and Austria—Austrians are also known to decorate the table with miniature pigs made of marzipan. Different pork dishes such as pig's feet are enjoyed in Sweden while Germans feast on roast pork and sausages. Pork is also consumed in Italy and the United States, where thanks to its rich fat content, it signifies wealth and prosperity.